Thought I'd share with you these fantastic bookends that I got as a birthday present a few years ago. 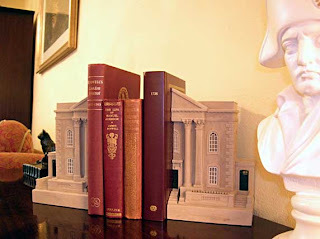 They are by Timothy Richards of Bath who makes architectural models of period buildings; mine is a split pair of bookends (as opposed to a single doorway) of Queen Anne House in Bath. Last I heard, the workshop was located 300 yards from Bath Spa station, but Richards also exports to the US (details on his website). I'm in good company because apparently Margaret Atwood has a pair of Richards' bookends incorporating plaster, brass and stained glass, which she was awarded at the 2005 Edinburgh International Book Festival. Love those bookends. I featured them on my blog a few years ago and was tempted to purchase a set. Now I wish I had.